If you have a special event, why not choose a cake from Confetti Cakes, and celebrate in style. Birthdays, anniversaries, Christenings, or any other special occasion can be catered for. 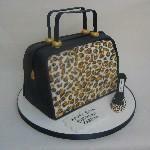 At Confetti Cakes, we have been designing and making celebration cakes for over 10 years. You can browse through the pages on this web site, or you may have your own ideas for a cake, just contact us to discuss your requirements. 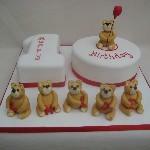 We can do all styles of cake, from traditional with sugar flowers to novelty. Cakes can be made in rich fruit cake, or a choice of sponges, including vanilla with buttercream and jam, chocolate, lemon, coconut or chocolate marble. Prices start at £18, if you would like a no obligation quote for a cake, just send an enquiry or give us a call.